Welcome to Los Angeles. You’ve seen his smile on Apple Billboards along the Santa Monica Freeway. Think Different! He wears Gucci Shoes, sports a Visor like the USC Trojan Football Coach, talks like Yoda and has a bad case of the giggles. So, for question number one. It’s getting around dinner time here in LA and that means only one thing, It’s time for Jeopardy!We’re the trivia capital of the world here. So for $500 let me ask you, “What seven year old king did FDR give a Rolex to in 1952?” If I haven’t already given the answer away in all those clues, you should go back to start. Or is that Monopoly? Yes, the one and the only lovable CIA agent from Tibet, on his annual Spring tour of the United States, the Fourteenth Dalai Lama of Tibet, Tenzin Gyatso. I personally had no clue he was coming, until a notification popped up on my LinkedIn account about a BIOLA University Professor I know whose profile mentioned that he had been the Co-Director of the MIT Dalai Lama Center for Ethics and Transformative Values! I was shocked. Wait a minute! Then I discovered that the same Center was a co-sponsor of the upcoming talks of the Dalai Lama at the University of Southern California which was originally founded by the Methodists. I emailed the Biola Professor in the School of Intercultural Studies, who I was relieved to find was never a member or associated with the organization. It was mysteriously posted to his profile. The Dalai Lama will be conducting the Highest Yoga Tantra in Long Beach on May 1, two talks at UCLA on May 2, two more talks at University of Southern California on May 3, followed by talks at UC Irvine on Wednesday, May 4. He’s done Larry King Live, probably will do the Brit soon, maybe he’ll ask him what he thinks about the royal wedding, how to treat your bride. Wait, he’s not married. Oh, that never stopped him from giving advice to 20,000 women at the California Woman’s Conference hosted a few years back by Maria Schwarzenegger where he received thunderous applause when he suggested that we need to introduce values and ethics to our youth, without of course religion! And then he taught the women how to meditate, which of course is secular.” You’re getting sleepy…, sleepy. Drink the kool-aid. Sarcastic? A bit. Why? Tired of pop culture and everyone putting their brain on hold. The Tibet wave has crested and the Dalai Lama is doing his victory lap. What do you mean? Well, since you probably won’t take my twelve session on Worldviews101.com course, I’ll give it to you in a nutshell. The other day, a leading Free Tibet spokesman, who needs to study his own brand of Buddhism, said it has been in Tibet 2600 years. Not really. Tibetan Buddhism is a migrant strain of Tantric Buddhism which arrived in Tibet in the 7th Century AD. That’s, let’s see, about, ah, give or take, 1300 years ago? The iconoclastic Muslims who believed in ONE GOD, basically obliterated their idols in India, defaced the Bamiyan Buddhas in Afghanistan, because they really believed in the commands not to have any other gods before Allah, the Name for the Muslim God. Interestingly, the Tantric Buddhist adept, “shaman” Padmasambhava, flies into Tibet, a Chinese territory. The Indian Tantric systems were a sophisticated system utilized by kings to institutionalize pluralism by assimilating indigenous cultures over a period of eighty or more years conquering them philosophically and physically through ritual. You may recall that the original Buddha was from the “warrior caste.” It was said, he was skilled in war. 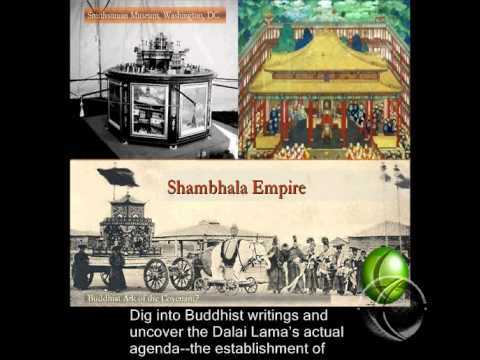 Tibetan Buddhists say that the Kalachakra initiation which is the ritual initiating devotees into a literal Tibetan Buddhist Shambhala Kingdom, originated with the Buddha himself. So what? Well, those rituals happen to be tied to a colorful seemingly harmless art object called a sand mandala. It so happens that those mandalas are not so innocent after all. In fact, the Tibetan lamas do many rituals prior to their construction in order that they do not themselves get possessed by malevolent demons, or so I was told by lamas at the Pacific Asia Museum many years ago. One look at a mandala map of the United States, including all the buried tantric “peace vases” gives you a cozy little feeling like our country should be doing very well since they’ve all been buried in our lakes, mountains, state parks, state capitols, sacred sites, etc. We should be the magical world of Shambhala where mystical flower blossoms drift down on the earth and rain falls so lightly, not even a clod of earth is broken. No fires, no tornados, no floods, no droughts, no economic distress. Everyone is happy in the new Shambhala Empire. We all now believe in World Peace, there is no such thing as jihad. Don’t listen to those weird researchers who say that Tibetan lamas would sacrifice their enemies and mix their blood with those beautiful butter sculptures as part of a sympathetic magic ritual to gain power over them. Those type of things just don’t happen anymore. Right? Mmm. Do I know something you don’t about their plan? Do they have a plan for conquering the West? One that is done under the banner of peace? On July 6, 2011 the Kalachakra Ceremony will be conducted in Washington, DC by the Dalai Lama. The same Kalachakra sand mandala, a magic circle that was built in Tower One of the Trade Center in New York City, will be the same one built in Washington, DC. So, beginning on April 28, 2011 in Long Beach, a sand mandala dedicated to the XIV Dalai Lama of Tibet, their god-King, will be built at the Terrace Theater in preparation for a special high level ceremony called the Highest Tantra Ritual for Tibetan Tantrik’s to be conducted by the XIV Dalai Lama. The vortex gate is being opened on the West Coast. Maybe I’m kidding. Mmm. I earlier read that the sand mandala being built in Long Beach was dedicated to Yamantaka, the god who destroys death, the fierce defender of Buddhism. Btw, Yamataka is the guardian of the West Gate of the Kalachakra Mandala, a blueprint of the Shambhala Empire being constructed in July in WDC. How quaint. I can see a “Far Side” cartoon caption now. “Being a lover of fine machinery, the Dala Lama naturally fell in love with his Rolex watch.” Any student of “Harry Potter” must know that machinery is but another name for witchcraft. A simple Tibetan Lama, also known as the Time God, wearing his Rolex and sporting a visor visits Tommy Trojan at USC. A University whose new President Max Nikias in his inagural speech believes is “the epicenter of global influence belonging in the pantheon of world class universities.” A University leading the way in the global pacific age “engaging in the pressing debates of the day” leading the “ongoing rebellion against the conventional order of things as we help individuals create limitless possibilities for themselves.” A University that will fulfill the “Destined Reign of Troy.” Strangely, while proudly pointing to their diversity and entrepeneurial roots, their is no sign of even a nod to their founding fathers, the Methodist Conference of Southern California. Well, here, the diplomatic rubber meets the road. Three things can happen. (1) “The Dalai Lama comes and goes like he did in 1989 when he spoke at the Shrine Auditorium across the street from USC. Everyone, politely looks the other way, saving face[By the way, his English has improved quite a bit when I heard him speak there with no security stations. I gave him a copy of the Gospel of Matthew in Tibetan. He rolled down his limo window and took the copy I offered him. I used to attend Buddhist general meetings at the Shrine when I was a Buddhist for fourteen years); OR (2) OR the Dalai Lama-Student Interfaith Council,-US-China Institute discusses the transition privately; OR (3) The “proverbial yak dung may hit the fan.” It’s hard to say. There are always wildcards. The only one missing is Hu Jintao. Prior to the Dalai Lama’s arrival on Sunday, May 1, the Dalai Lama’s frontman, Columbia Professor Robert Thurman, actress Uma Thurman’s father, and called the Billy Graham of Buddhism in America, will be speaking in Santa Monica at Eli Broad Stage on Saturday, April 30. It’s a small world. I remember as a Buddhist, filling in one day as his chaffeur for Paul Diamond, one of my members who was Broad’s chaffeur. Little did I know that he was to become the wealthiest philanthropist in Los Angeles as a result of his development business Kaufman and Broad. “Pick up three newspapers on your way to his house. You’ll drive his Jaguar to the UC Regents meeting in Long Beach. Los Angeles Times, Wall Street Journal, and the New York Times.” At least that’s what I remember. Now, who’s opened the doors to the Dalai Lama in the United States? Senator Diane Feinstein, then Mayor of San Francisco. I recall the political ad which featured her standing with a statue of Avalokitsevara, the patron Deity of Tibet, aka the Dalai Lama in the background, pictured over her right shoulder. She married Richard Blum, the Director of the Himalayan Arts Foundation. Their marriage was blessed by the Dalai Lama god-king in Dharamsala, India. Blum is now the President of the UC Board of Regents and introduced the Dalai Lama last year when he spoke at the University of California at Santa Barbara at the invitation of Professor Jose Ignatio Cabezon, the Department Chair of the XIV Dalai Lama Chair of Tibetan Buddhist Studies. Hmm. Maybe Universities are the Left’s Seminary. And practically every member of the US Congress and President G.W. Bush when they awarded the Dalai Lama the Congressional Gold Medal. The Nechung Oracle, the “demon-possessed” Tibetan shaman who the Dalai Lama consults on all important state decisions was hosted and introduced by the chaplain of the US House of Representatives to one the Christian leaders in Capitol Hill. Are the Gatekeepers of our nation asleep? This Passover I read with concern the passage in the Second Book of Kings where Elijah says to the King via his messengers, “Is it because there is no God in Israel that you are sending to inquire of Baal-Zebub, the god of Ekron? (2Kings 1:6-8).” Isaiah the prophet, proclaimed the Word of YHWH, “O My people! Those who guide you lead you astray, and confuse the direction of your paths” (Isaiah 3:12b). Remembering the Commands of the LORD, “Do not turn to idols, and do not make for yourselves moulded mighty ones. I am YHWH your Elohim” (Psalm 19:4). Remember, the blesses and curses in Deuteronomy chapter 28 that are appointed to those who chose to either obey YHWH or to fall under the curses written in His Torah if they walk in paths they call their own. And on May 9th, the Dalai Lama will be a speaker at Southern Methodist University, home of the George W. Bush Presidential Library, where he’ll receive the Hart Foundation’s Global Leadership Award. I sadly remember that First Lady Laura Bush after 9-11, desired to see the Bamiyan Buddhas restored that were defaced by the Taliban. Morris continued, “Thurman has written 20 books related to Tibetan Buddhism and in 2008, the year China hosted the Olympics, published “Why the Dalai Lama Matters: His Act of Truth as the Solution for China, Tibet and the World,” which outlined a 10-point plan for China to make Tibet an autonomous region under a “one country, two systems” model.” It may be an interesting turning point in the history of Tibet or China or the United States. I guess that some perceive that the Dalai Lama is the lynchpin of US-China Human Rights Relations.